Number of repeating InstrAttribType entries.. Entry of InstAttribEntry repeating group. Definition at line 2527 of file Messages.h. Definition at line 2539 of file Messages.h. Definition at line 2542 of file Messages.h. Definition at line 2548 of file Messages.h. Definition at line 2579 of file Messages.h. Definition at line 2586 of file Messages.h. 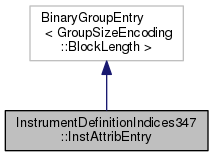 Code to represent the type of instrument attribute. Definition at line 2559 of file Messages.h. Attribute value appropriate to the InstrAttribType (871) field. Definition at line 2568 of file Messages.h.